resources are mysterious green globs. There is no way to tell what you are gathering which is kind of lame and annoying. This may be a game mechanic decision but it is an ui issue in the end as well. It does not even make sense. You cannot really gather something without knowing what it is. If you gather bark then you must have peeled bark and not chipped off shell pieces. You can target with the keyboard (hit k for the keys settings, action keys), if thats not sufficient you can use macros, to target very specific and even combine the target action with other actions. In fact we have no auto-loot or key for that, it’s a feature in maybe all other mmos I ever played. You train, spend the skill points and eventually learn to see what is inside a node before you dig it. And you learn to prospect only specific materials and qualities. When you are on main land, you can care plan for a high lvl player, that gives usually very good xp. The radar and the map are ok in combination. You can right click the map and create own landmarks, then set the landmark in the radar. Best Ryzom map ever, bmsite.net, check out the little half transparent button thats in the middle of the map navigation. sie findet es unlogisch alles was man ernten kann aus grüne blasen zu sammeln. rinde zb müsste man von bäumen schälen können. wenn man alles fast in Fossil umbenennen würde, wäre es logisch aus dem Boden zu graben. aber Logik ist nicht immer da ^^ besonders nicht wenn es kein NORMALER Planet ist ^^ der ein eigenes leben besitzt. ich hochpersönlich fände es schlecht wenn ich für jedes material ein anderes Werkzeug und was anderes zum ernten suchen müsste. das wäre mir schon wieder viel zu nah an die ganzen Standarte Spiele wo es so ja ist. Thanks fore the replies. Seems some of the problems fall in the "no tutorial for it" category - because they work differently in Ryzom and because new people need to learn about it anyway even if it's the same as in every other game. I find the lack of looting key annoying. Since looting is kind of required to progress in some quests and crafting and it's annoying my overall impression of the game is not positive. I can understand it may take skill to see quality of a piece of bark or to prospect for it but once it is on the ground you should be able to see it is a piece of bark without any skill whasoever. It is against logic and against new people to have only mysterious green globs. Maybe the User Manual page at Ryzom Wiki should be mandatory reading, or at least more publicized. mouse-only navigation. There is no way to target with keyboard, pickup with keyboard, gather with keyboard. This is the reason I never reached the maximum free level in WoW and this is the reason I will probably not play Ryzom either. There are ways to target with the keyboard. There are even more if you use the macro system. When I dig, I can just hit one key and that will make me run over to the nearest dig spot with my name on it and start digging. I have other macros to target various entities. Sadly, those are not exactly the sort of functions you would figure out on your own. There is not NPC in Silan that tells you about macros or / commands like /tar. Those are the sort of things you have to dig a little to find they even exist unless someone tells you. With the Knowledge stanza, it's easy to scout an area and dig only the spots that have what you want. With the material specializations and different grades of "Find better materials" stanza, you can go into an area that has 5 different mats in three different grades (many spots have Basic, Fine, and Choice) and pop ONLY what you want. Sure, I may be in an area with Basic resin and Choice node, but if I want Fine wood, then the only spots that I pop are all Fine wood. Such are the perks of being a high-level digger. That said, it's really rough at lower levels, especially if you don't have a lot of flags on your map denoting where to dig for what. I recall having the same complaint when I first started, and I can safely say that it gets MUCH better if you persist. Digging is probably the hardest and most frustrating of the four skill trees to start out, but it's also the branch that improves the most as you level up. The other three branches just have you doing the same things against higher-level enemies or making gear with a couple of stats higher than what a lower-level crafter can do, but the difference between a low-level digger and a master digger is just phenomenal. The 'radar' is very hard to read. You really need both the map and the 'radar' to make any sense of anything. At least on the tutorial island the map is small enough to have it open all the time but until you figure out how to use these two together there is no way to get anywhere. Yes, it is a bit daunting at first, but I've found that the only way to avoid a learning curve is to sacrifice usefulness. The compass/radar has many uses, including but not limited to a rangefinder. Knowing the exact distance to your target is immensely helpful for casters, shooters, and those trying to tip-toe through agro-filled areas though. When zoomed in to 50m range, it's quite effective at finding safe paths too. Or maybe you want to know where the next waypoint is for occupations. Of course, multiple functions means a slight lack of ease of use. The map is also small enough to keep open on Mainland, though you may wind up zooming in/out on it a bit depending on what you are doing. While I can see some merit in combining the two, I think doing so would actually make things more complicated than keeping them separate, as well as reduce/eliminate some of the utility of the current system. Those I do not know exist. There are probably quite a few. There is no in-game tutorial about the controls. Hit 'k' to see the keybindings and you'll find quite a few things you wouldn't even suspect. The list takes a bit of scrolling so I won't try to post a screenshot, but suffice it to say that I learned a lot by being curious and pushing buttons. That said, there is quite a lot of stuff that is non-intuitive that only the intensely curious would ever have a chance of finding out. And lets be honest, not everyone has the blend of patience, curiousity, and computer savviness to dig around and learn from it. In fact, relatively few people do. Ryzaom could do a better job accomodating those outside of that small demographic of intensly curious people with too much free time. Seems some of the problems fall in the "no tutorial for it" category - because they work differently in Ryzom and because new people need to learn about it anyway even if it's the same as in every other game. I've always felt Silan was a little lacking, but much of that is because there is no opportunity to review. If you don't learn something when the NPCs teach you, your only real recourse is to ask in Uni. Given how many people skip through dialogs they feel will have no relevance to their future, that means a lot of players run into trouble with magic, digging, and crafting. I find it an effective anti-botting measure. Sure, it's sometimes a hassle to run up to your kill and press a button on a pop-up window, but when the alternative is a world full of bots, I think the effort of looting a kill the way we do it is a small price to pay. Think about it; how worthwhile would it be to try to hunt mobs if a few hundred homins had a script that targeted the nearest mob, killed it, looted it, and repeated the cycle with no human intervention at all? That'd make for a boring game, right? But with the macro system built into Ryzom, it'd be almost trivial to make such a script if there were a way to loot easier than we do now. Besides, double-clicking on a dead mob will make you run over to the corpse and pop open the loot dialog anyways. Three clicks and you got loot! Why not use a button you already have a finger on all the time anyways instead of having to remeber yet another keybind? The mats you pop are not on the ground; they are still under the ground, hence the need to dig for it after you prospect. Picks are not for lifting stuff off the ground, but for making a hole in the ground. The green globs are more of a "Dig here for mats!" than the actual mats themselves. It seems perfectly logical to me. What I feel is illogical is to have even a beginner forager be able to "meditate" for a few seconds and have stuff buried underground materialize on the surface. When I think "forage", I think of the effort it takes just to find what you are looking for, then a bit more effort to actually obtain what you found. A more skilled forager will find stuff easier and obtain it quicker, but even a master forager is not a conjurer or transmuter. It is not a working anti-botting measure at all. It was somewhat effective for that 12 or 10 years ago, but not anymore for a very long time. And other game publishers know that a measures like this doesn’t keep ppl from botting, thats why in every other game I can loot with a keyboard key or even fully automatic. What would be the advantage of looting while botting anyway? Faster re-spawn, but while you are botting what would you need faster re spawn for? The mats from fight training are not worth anything on sale either. And for digging, I’m sure a bot for digging needs to be so advanced that looting is not really the matter there. And I have different habits, I don’t have my finger on the mouse button all the time, I have to move my right hand back and forth from the keyboard. @Yubina - While you are correct that it's not 100% effective, Ryzom's macro system would make botting easy enough that my cat could do it if not for little things like lack of auto/one-key looting. 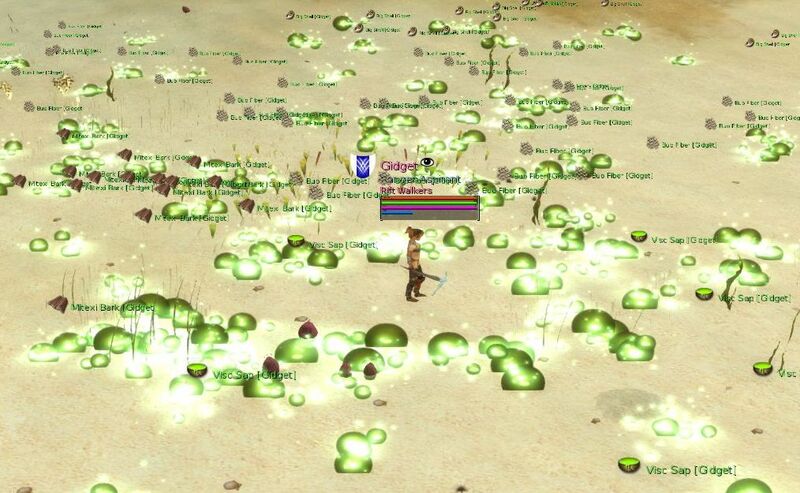 Other games lack the macro system, so one-button looting is less of an issue, but getting the enemy to a lootable state is easier in Ryzom than in many other games. Sure, a competent bot-maker could still make an effective bot, but even that one little detail that macros cannot handle requires enough added effort to get around to weed out the majority of script-kiddies. Remember, many who would even think of botting are lazy, and even a dramatic reduction is a good thing, especially if it's trivial to implement. Maximizing XP/hr is important to some folks. Very important. Even if the bot is doing all the work, it's still good to optimize. Even if you must empty your bag manually every 20 minutes, the ROI on time saved waiting for respawns would be too big a temptation if you made it easier than three aimed mouse-clicks. That truly is different. The only time I take my hand off the mouse is when I'm chatting. I also play enough FPS and RTS that my right hand is on the mouse most of the time I game. I can't think of anyone I know who does it differently either. But if that's what you do and it works, then keep on doing it your way. I hope you are still reading because there are two different ways to navigate using the keyboard. Either with the arrow keys (works together with mouse navigation) or WASD. Targeting with keyboard has been covered (including the use of macros for special targeting. The lack of easy pickup has also been addressed. The reason I hope that you are still reading is that I would like to urge you to reconsider. The world you haven't seen much of yet (since you are still in Silan) is amazing, beautiful, and challenging. There is a reason there are so many of us old farts still around: even when we have all (or at least a whole lot) of high level skills, Atys continues to challenge us. If the content cannot be put in game then at least a npc or info board that says how to find it could be useful if placed well. I hoped higher level profession in armor making will allow to create more different armor designs rather than same armor with different numbers .. but maybe I had too high expectations of the crafting system. That's not really a problem. I can read and I can create a new character and do the tutorials again, too. This is a game so it is supposed to be about things you want to do rather than things you would rather script. So if you need anti-botting measures it is a design failure and you add an insult to an injury when the anti-botting measures get in the way of people enjoying the game. Because it is totally not true. muticlicking is totally annoying interface - you either get unwieldy mouse that gets painful to use after a few thousand clicks or you get a tablet. And a tablet must be either resonably sized with no way to effectively multiclick with muticlick distance detection tuned for mice or huge, expensive, and taking up too much room to use comfortably with a keyboard. There are surely more expressive ways to denote dig spots than green globs. It does not make much sense for half of the stuff to be underground, anyway. Especially the beginner resources you see without prospecting. So it would make sense to show resources as whatever they are if you can see them without prospecting or you used right prospecting skill to know exactly what resource you get and some generic dig spot markers for the rest. Finally there is another interface issue with the camera zoom control with mouse - as you move mouse a bit further from where you pressed the mouse button camera starts rotating like mad. This can be surely solved better and is in many games that use mouse for camera control. That would qualify as "more publicized", so it seems we agree. I'm not sure how many more types of armor we need. Then again, this isn't a game where armor grants special abilities like invisibilty or enhanced regeneration either. Aside from enchants that allow for insta-casting on the move, anything a homin can do is something they are capable of with no gear at all. Gear may enhance abilities, but gear doesn't grant abilities. With that in mind, what sort of armors would you propose? Something that would shift the focus away from the character and more towards their gear as well as alter the fundamental nature of the game plus require rewriting a large percentage of the code? Or simply a wider range, like Extra Heavy armor with stats comparable to what NPC HA has? (Of course, that would be a major slap in the face to those who went through the effort to get a full suit...) Please, elaborate! In an ideal world where people behaved ideally, I would agree. However, I don't see how accounting for the fact that the really real world is not ideal is a design failure of the game. Is having seat belts in a car a design flaw? Is the mere existence of door locks offensive because it requires slightly more effort to get into your home? Most importantly, is it really that much of an inconvenience to have to use something other than the keyboard? I have one hand on the mouse for many non-gaming things I do as well, including but not limited to CAD/CAM, multimedia editing, data entry (easier to click once than hit Tab 3-30 times! ), and reformatting text (a lot of selecting and copy/pasting). The way most mice are shaped puts the buttons right underneath the index and middle fingers. If multi-clicking is annoying then you must hate Windows, OS X, and most Linux distros as well. But since you mentioned it being painful, it sounds more like you probably just haven't found a pointing device with good ergonomics. Personally, I am rather fussy about my mice (especially finding one big enough for my hands; I can easily hit both SHIFT keys, so I find many mice uncomfortably small) and use a palmrest to keep my wrist from being forced into unnatural positions. I'm at an age where all my joints hurt even without getting within ten miles of a mouse, but I manage to avoid additional pain even when I spend half a day gaming. The only time my hands hurt from mousing is when I am forced to use a too-small mouse, especially one designed for a laptop. And you forgot about trackballs, joysticks, and vertical mice. I know some people with joint issues (arthritis, poorly healed injuries, or just plain old age) that use those. It's all about ergonomics. If you always have both hands on the keyboard then I must wonder what other games you play. Most of the PC games I can think of that came out in the last 15 years require fairly extensive mousing, but that might just be a matter of me having different gaming preferences from you and thus being unfamiliar with "no mouse required" games. I'm not even a big FPS player, yet I wind up using keyboard+mouse simultaneously in most games in addition to the non-gaming stuff mentioned above. If you think of prospecting as a spell that temporarily highlights the location of mats then it makes sense. After all, the only thing prospecting does is locate mats; it doesn't extract them. It does if you want a consistent mechanic for all foraging activities. How do you learn about extraction if you don't extract? Most of the training I've had has been geared towards how things actually will be when I need those skills outside of a training environment, and almost all of it involved practice not unlike extracting mats in a pre-popped field in Silan the same way I now extract spots I prospect myself on the Mainland. Also, you will find those pre-popped spots have their drawbacks. The first time you sit for a few minutes waiting for your Focus bar to regenerate, you'll understand. The only use for those pre-popped spots is for those who have a Forage skill in the single digits who have not yet purchased Basic Prospection. For pre-popped spots, they are generally all the same thing. The only deposits I have seen with mixed mats are all spots that you must prospect to see any spots at all. As for the right prospecting skill, there is Knowledge. Here I am playing with Knowledge 2. Any guesses as to what mats each spot is without having to start digging? While I can get the camera to spin like that, it takes a deliberate effort for me to do so. It's a bit easier for me to do on a trackpad as my Toshiba's trackpad is considerably smaller than my desktop's mousepad. It sounds to me like either your mouse has the sensitivity set too high, or you are moving your mouse too far. For perspective, even though I can go from one side of my 1920*1080 screen to the other with less than 2 inches of mouse movement (just a flick of the wrist), it still takes me about an inch of movement to pan the camera 360 degrees. In order to spin wildly, I have to move from the elbow and slide the mouse a good 6-8 inches; far more than the distance it takes me to get the pointer from one side of my screen to the other. So unless you are dragging your mouse the same distance you would on a Wacom tablet (which would qualify as "doing it wrong"), it might be time to dig into your mouse settings and make some adjustments to the tracking speed. If the client is in windowed mode and you set the viewable window to be max screen size, it resizes down on a relog. It does this twice on Windows but only once on Linux. If you do not catch the 2nd resize on Windows, all your UI elements are moved around. Please for the love of Kami get rid of the hard coded small window size on launch. Have it remember last screen size. This has been a bug since Ryzom was owned by Nevrax. Ui positions and macros don't save unless you cleanly exit the client. A crash or hard exit nothing gets saved. It would be awesome to have a real time save of UI and macro element changes. Windows that a player may not want open are forced to close them on every relog. Mine currently is the mission window. It used to be the Home window as well. Allow a "snap to" window positioning. So one can slide windows next to each other and they snap to the edge of the next window (preferably without a gap). A horizontal scroll in the skill tree window so one doesn't have to resize this window huge to see mastered skills. A resizable macro window, as is it takes up too much screen horizontally. A complete redo of the UI setup to allow for player made custom UI skins. Think Everquest or WoW here. All based on xml and/or lua. If the client is in windowed mode and you set the viewable window to be max screen size, it resizes down on a relog. It does this twice on Windows but only once on Linux. If you do not catch the 2nd resize on Windows, all your UI elements are moved around. Please for the love of Kami get rid of the hard coded small window size on launch. Have it remember last screen size. I'll see if I can reduce the forced switching or 2nd resize issue on Windows. Unfortunately login/char select UI is currently fixed to 1024x768. Many years back I experimented with the size change and got char select to play nice. I lost that code locally but I do remember it was not a pretty sight to mess with. Very awesome to hear of the save button.